Based on the bestselling novel and Tony Award winning screenplay of the same name, this charming tale of friendship between a teenage boy and a horse is genuine with a hint of fairytale. Their extraordinary bond, courage, loyalty and hope are tested in every way. Audiences will especially enjoy galloping along the horse’s magnificent journey as he touches countless lives in unique ways along his adventure. It is remarkable that a voiceless horse can tell such an incredible and timeless story. “War Horse” will likely conjure a tear or two, even from the most cynical viewers. This stellar cast includes several talented newcomers. 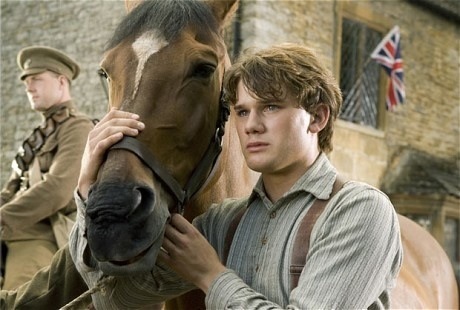 Twenty year-old British actor, Jeremy Irvine (who slightly resembles a young Patrick Swayze), plays Albert Narracott, the young boy who befriends a special foal and names him Joey. Scottish actor, Peter Mullan plays Albert’s (“Albie’s”) stubborn father, Ted, who will stop at nothing in order to prove to the town that he will find a strong and skilled horse to plow his crops. English actress Emily Watson plays the motherly role of Rose to a tee. Her calm, cautious and practical nature contrasts Mullan’s competitive and impulsive personality. Ted and Rose Narracott are diligent famers trying to earn their keep to pay the condescending landlord (David Thewlis) so he will not evict them. Meanwhile, despite his father’s doubts, Albie begins taming and training the uneasy, young horse. Full of skepticism, the entire town is astounded when the Narracott’s determination proves worthy; Joey plows the fields. Watching a boy lead a horse while it plows a field sounds incredibly mundane but Spielberg has a way of making it a profound moment, as with almost every scene in the film. The pulsating soundtrack and variety of camera angles is instantly captivating. This, coupled with the sound of Joey’s hooves striking rows of rocks in his path and the cheers of the townspeople surrounding their land make for an unexpectedly intense scene. It is especially interesting to point out that Spielberg, a horse lover himself, was adamant about using real horses in a majority of the film instead of puppets, adding to the authentic experience. The powerful scenes do not cease. Before we know it, their crops are washed away one night during a severe storm, forcing Albie’s father to sell Joey to the British cavalry. The forced separation of Albie and Joey is heart wrenching as they are uncertain whether they will ever see each other again. As Albie is held back from trying to save his best buddy from the harsh realities of war, the unconditional love shown through Joey’s eyes is incredible. No words needed. There are several scenes that zoom in on Joey’s affectionate eyes and they will certainly make the hearts of animal lovers melt. In contrast, the scene in which the British unexpectedly stampede right through the Germans encampment will provide audiences with an enormous adrenaline rush. Overall, the battle scenes are fairly clean compared to the typical Hollywood war setting. This aspect makes the film even more suitable for families but may disappoint those who don’t want to leave anything to the imagination. Despite it’s serious storyline, the script is unpredictably clever as witty lines are peppered throughout, even during intense scenes. When Ted went into town to purchase the unfavorable Joey at the auction, the auctioneer commented on Ted’s quick and unaffordable bid, “more dollars than sense, here,” he joked. Some may rank Spielberg’s, “War Horse” of the caliber of his other masterpieces, Academy Award winning films, “Saving Private Ryan” (1998) and “Schindler’s List” (1993). I predict this film has a great chance of following in those same footsteps at the 84th Annual Academy Awards. If I had to have any qualms regarding, “War Horse,” I would say that the 2 hour 20 minute runtime is a bit lengthy and some of the musical score in the beginning of the film seems inadequate. Nevertheless, this film will surely tug at your heart. Saddle up and get to the theater. “War Horse” is surely worth the ride. Bottom Line: A sure bet for some Academy Award nominations, sentimental, heartfelt, talented new faces, charming script, and breathtaking scenery. “War Horse” is especially touching for animal lovers – worth a trip to the theater.